At least 18 people have been killed in a bomb explosion in north-western Pakistan, officials say. 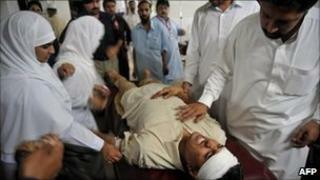 More than 30 people were wounded in the bombing at a bakery in the town of Nowshera, they said. It followed a blast in another north-western town, Matani, which left six people dead. Both attacks come after reports that a top al-Qaeda operative, Ilyas Kashmiri, had been killed in a US drone strike in the tribal region of South Waziristan. Militants in Pakistan have vowed to avenge his reported killing, as well as the death of al-Qaeda leader Osama Bin Laden. He was killed by US forces in a garrison city north of Islamabad on 2 May. The head of the Nowshera bomb disposal squad, Tanvir Ahmed, said he believe the bombing there was a suicide attack. "It was a huge blast," said Zakaullah Khan, the town's top government official. "It shattered the bakery and a restaurant nearby." Witnesses in Nowshera, about 50km (30 miles) east of Peshawar, said they saw charred bodies lying on the ground. At least two soldiers were reported to be among the dead. A Taliban spokesman, Ehsanullah Ehsan, told the AFP news agency that the group was responsible for the bomb. The Taliban have claimed responsibility for other recent attacks. The bomb in Matani, about 20km (12 miles) south of Peshawar, was planted at a bus stop near a market where it hit a passenger vehicle earlier on Sunday, officials said. At least 10 people were wounded.